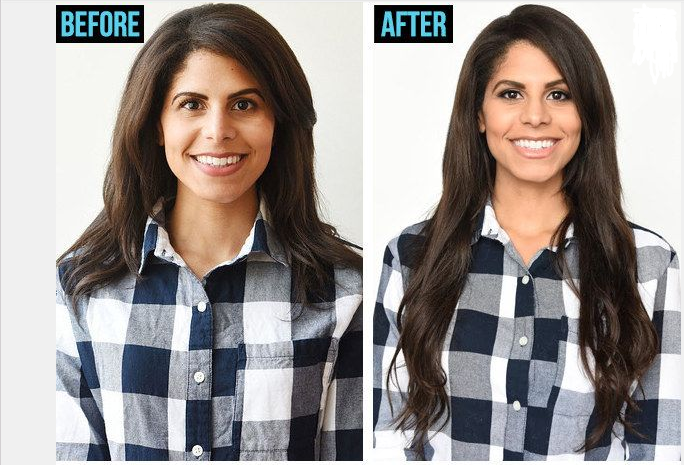 Why we need clip-in hair extensions? Bcause it can make our hair looks more fuller and longer. If your hair is very thin,why not choose such a hair extensions? Its very useful! Now,I'll show you how to clip your hair extensions yourself step by step. Step 1. Brush both your hair and the wefts before applying them. Step 2. Separate a thin section of hair at the nape of your neck and clip the rest away. Step 3. Separate another thin section of hair above the first clipped weft and repeat the process with the big,4 clips weft,the other 3 clips weft and finally with one of the 2 clips weft. Step 4. Separate a thin section of hair higher above the ear and appply one of the 2 clips wefts. Step 5. Repeat the exact same process on the other side of your head. And done!